Why, exactly, are these cheesecakes named after a reptile? Well, because they get their name from a candy. Developed in 1918 by DeMet's Candy Company, these delectable bites were made of pecan pieces that were coated in caramel and then enveloped inside a glob of gourmet chocolate. And why were they called turtles? Because they actually looked like turtles with a large, chocolate covered shell. 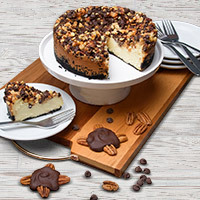 We're all about tradition, so we created the same treat, only in cheesecake form. 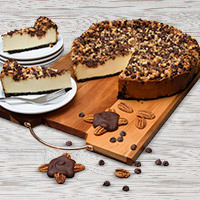 Our smooth Turtle Cheesecakes are comprised of chocolate cheesecake that's baked into a chocolate cookie crust and topped with caramel, pecans, and chocolate morsels, making an elegant dessert desired by all.